Fiction writers and literary critics speak of point of view. Social scientists are more likely to discuss perspective. But both of these terms refer to essentially the same construct: the consciousness behind the perception and narration of experience. Each individual’s point of view is unique, and point of view shapes the stories people tell to themselves and to others about themselves and their relationships with their environment. The same event narrated from two different perspectives will produce two different stories. Change of Perspective Is Moving! Professor Howard Zinn is probably best known for his revisionist history book A People's History of the United States, published in 1980. When my daughter was in high school about 15 years ago, I was quite impressed that her history class was reading this anti-establishment book, which offers a perspective on American history decidedly different from the standard fare. Professor Zinn retired [from Boston University] in 1988, spending his last day of class on the picket line with students in support of an on-campus nurses’ strike. Over the years, he continued to lecture at schools and to appear at rallies and on picket lines. Yep, that's exactly how I remember Howard Zinn. Michael Phelps was the swimming star at last summer's Olympics, but a more low-key competitor was American breaststroker Eric Shanteau, who postponed treatment for testicular cancer in order to compete in Beijing. After successful surgery in August, Shanteau recently returned to competition at the U.S. Short Course Nationals, where he swam personal best times in the 200-yard individual medley and the 100-yard breaststroke. "This experience gave me a very different and new perspective on life -- it's a good one," he said. Here in the United States we're celebrating Thanksgiving today. We've taken a proprietary hold on this holiday, incorporating it into our national myth and folklore, by portraying it as a unique event involving Pilgrims and Indians that commemorates the founding of the country. In reality, though, harvest celebrations are as old as agriculture itself. Throughout time cultures have offered thanks to their deities for the fruits of autumn. The cornucopia, or horn of plenty, has become the ubiquitous symbol of these celebrations. Although now we most often see the cornucopia portrayed as a woven basket holding produce, the original cornucopia, as the word's Latin root tells us, included an animal's--probably a bull's or a ram's--horn. One autumn an Asian man participated in a life story writing workshop I was presenting. He is now an American citizen, and his children were born here in the U. S., but he wanted to write about his childhood experiences so his children would know about their Asian heritage. When he read his narration of how the residents of the village presented offerings of rice to the gods and visited relatives on a day in autumn, the other workshop participants commented that this sounded a lot like our American Thanksgiving. It would have been more accurate to say that our Thanksgiving sounds a lot like the ancient Asian tradition of giving thanks. We don't have a monopoly on autumnal thanksgiving, even if we do spell it with a capital letter and get a paid day off from work. Sharing life stories with people from another culture can broaden our perspective on our place in the world and in history. I'm working on a research proposal for school right now. As exhilarating as it is to be getting near working on my dissertation, this phase is very time-consuming. Consequently, I'm resorting to a list of a couple of tabs I've left open in my browser for far too long in hopes of being able to write a separate post about each one. The 1918 influenza pandemic killed more than 50 million people worldwide including an estimated 675,000 people in the United States, and it is one of the touchstones for today’s public health preparedness initiatives. To put it in perspective, that’s more people than all those who died (both military personnel and civilians) during World War I (1914–1918). T The 1957 Influenza Pandemic caused at least 70,000 U.S. deaths and 1–2 million deaths worldwide. Improvements in scientific technology made it possible to more quickly identify that pandemic when compared with the 1918 event. These first-person and family accounts contained herein provide an intimate, personal view of the 1918 and 1957 pandemics that goes beyond the staggering statistics associated with those events and, therefore, can help planners re-energize their efforts and fight preparedness fatigue and apathy. "Author of A People's History of the United States shares his thoughts on revisionist historians, the upcoming election and more"
Howard Zinn was an activist professor at my alma mater, Boston University, in the 1960s. His book A People's History presents a different perspective on American history than the one usually taught in school. It is unlikely that 20 years ago, when Howard Zinn's magnum opus A People’s History of the United States: 1492 to the Present was published, that anyone thought it would sell close to two million copies and spawn an entirely new historiography. Today, though not quite a household name, spry octogenarian Zinn is a much in-demand lecturer, criss-crossing the country, speaking to crowded halls and auditoriums and continuing his life-long commitment to social justice activism. Former Hollywood screenwriter Dennis Palumbo is now a psychotherapist, book reviewer, and author of both nonfiction books about writing and crime fiction. In his psychotherapy practice he specializes in working with creative people. Funny you should mention writer’s block, because I hold an unconventional view about it: namely, I think that writer’s block is good news for a writer! In my view, a ‘block’ is merely a stage in your growth in craft as a writer, similar to the developmental stages we all go through as we mature in life. Just as a toddler needs to struggle---risking and failing over and over, as he or she learns to walk---so too does a writer experiencing a ‘block’ need to learn to navigate and master that particular developmental stage in his or her work. Perhaps the writer is trying to write a more complicated plot than usual, or is delving into difficult personal/sexual material for the first time. Whatever. And I think the proof that a block is a necessary developmental step in a writer’s growth is that, in my experience, after writers have worked through a block, they report feeling that they’ve grown as writers, that they’re more confident about their craft, or that the work has become more personally relevant. What a refreshingly different perspective: writer's block as opportunity rather than infirmity. And what he says makes perfectly good sense. I have noticed writer's block seems to set in most often when I'm trying to do something I haven't done before. In my case the blockage most often develops when I'm dealing with sensitive personal material and/or trying to write in a more personal voice than I'm commonly comfortable with. I'm grateful to Palumbo for making me realize this and also for enabling me to see writer's block as a growth opportunity rather than a stumbling block. There's much more of interest here, so jump on over and read the entire interview. Perspective: What Are You Looking At? Over at Quinn Creative, writer and creativity coach Quinn McDonald discusses an "Aha!" moment she had during a recent airplane trip. Photos can be an especially effective means of communicating exactly what perspective means, and Quinn offers a couple of her photos here. The blog Between Us Girls offers some answers to the question "How do we keep things in perspective so that we aren't overcome with anxiety every time an obstacle shows up in our lives?" One of the commenters added yet another way to analyze a current problem: Ask yourself "Have I ever dealt with a problem like this before?" That's very good advice, and it's precisely for answering this kind of question that journal writing can be such a valuable tool. More on that topic in a future post. . . . This novel is about family stories--in this case, the truths that don't get told and the lies that spring up to fill the void--and how those stories reverberate through generations. Iris Lockhart is a 30-something woman busy managing her vintage clothing shop in Edinburgh, juggling a tense relationship with her stepbrother Alex, and trying to sidestep the increasing demands of her latest married lover. Besides Alex, Iris's only family is her paternal grandmother, Kitty, who is in the clutches of advancing Alzheimer's disease. Then one day Iris receives a shocking phone call: A nearby mental institution is closing, and Iris must make arrangements for her great aunt Esme, Kitty's sister, whom Iris has never heard of. Kitty always claimed to be an only child. However, the institution's paperwork proves that Esme is Kitty's sister, and Iris can see a hint of her dead father's face in Esme's. Iris agrees to take Esme to a residence home arranged by the institution but finds the home too appalling to leave Esme there. Iris therefore has no choice but to take Esme home for the weekend with her, to an apartment carved out of the family home in which Esme had lived before being sent to the institution more than 60 years ago, at age 16. As Esme caresses the doorknobs and looks into the well-remembered rooms, Iris tries to question her about the past. Understanding this novel requires an attentive reader able to put together the pieces of the puzzle in a process that amply demonstrates that there's always more than one side to every story. In a sudden flash of insight Iris puts all the pieces together in the book's abrupt, dramatic climax. I would have liked to see a bit of dénouement about how Iris's new knowledge will affect her life. Nonetheless, the novel richly repays the reader's investment of time and effort. The Vanishing Act of Esme Lennox deals with many important issues: truth, the subjugation of women, racial and gender stereotypes, colonialism, social propriety, the meaning of love and of family, parenting, and the treatment of mental illness. Quinn McDonald, a creativity coach, has a nice piece on the effectiveness of perspective switch on her blog. She uses a couple of photographs to illustrate how a change of perspective can influence what we see and how we think about what we see. Psychologist Carol Dweck has been studying intelligence for a long time. In an article in the current issue of Scientific American Mind (see complete reference at end of post) she discusses what she has discovered about how children's ideas of intelligence influence their performance. One key discovery is that children's beliefs about intelligence inform their motivation about learning. Children who believe that intelligence is an innate, unchangeable trait often become frustrated and give up when they come up against something such as a math problem that they can't solve. In contrast, children who believe that intelligence is a quality that can develop as they learn approach a difficult math problem as a challenge, an opportunity to look for and try out new potential solutions. Dweck calls these two groups helpless and mastery-oriented learners, respectively. Helpless learners, who think that intelligence is a fixed trait, believe that they have only a set amount of intelligence. Dweck calls this a fixed mind-set. When helpless learners encounter a problem they can't solve, they become frustrated and give up because they think they just aren't smart enough. Such children see mistakes as the result of a lack of ability, and to them lack of ability is something they can't change. Mistakes undermine their self-confidence, and they therefore avoid challenges, because challenges make mistakes more likely. These children fear that working hard will make them look dumb. Students with a fixed mind-set are more interested in getting good grades than in learning. Mastery-oriented learners, on the other hand, believe that intelligence is a quality that can be developed through education and hard work. These children think that mistakes result from a lack of effort, not a lack of ability, so their mistakes motivate them to work harder. They see challenges as exciting, as opportunities to learn. Dweck calls this a growth mind-set. Students with this mind-set value learning over grades; in addition, their belief about the effectiveness of effort motivates them to try harder when they receive a poor grade. Dweck's research has shown that programs designed to teach students they can increase their intelligence through education and effort work for students at all levels, from elementary school through college. To help students develop a growth mind-set rather than a fixed mind-set theory of intelligence, Dweck and colleagues have developed an interactive computer program called Brainology, which she says should be availably in mid-2008. The program teaches students about what the brain does and how they can make it work better. Fostering a growth mind-set about intelligence will help people function better not only at school, but also at work and in their social relationships, Dweck says. In the work world, people whose growth mind-set has taught them that feedback leads to improvement will be more receptive to constructive criticism and advice than people with a fixed mind-set. In personal relationships, people with a growth mind-set will probably be more willing to acknowledge problems and try to work through them than will fixed mind-set people. Don't praise your children's intelligence. Instead, compliment them on their effort, determination, and perseverance. Discuss mistakes not as failures, but as challenges or opportunities to learn something new. If children become discouraged or frustrated, encourage them to look for different ways to approach a problem. Teach children about famous people (Dweck suggests Marie Curie and Thomas Edison) who accomplished great things through dedication and great effort. The point is to help children develop a growth perspective rather than a fixed perspective on intelligence. Dweck, Carol S. "The Secret to Raising Smart Kids." Scientific American Mind December 2007/January 2008: 36-43. This New York Times article by Benedict Carey is about the person you could have been (or could have become), what psychologists call lost possible selves. Over the past decade and a half, psychologists have studied how regrets — large and small, recent and distant — affect people’s mental well-being. They have shown, convincingly though not surprisingly, that ruminating on paths not taken is an emotionally corrosive exercise. The common wisdom about regret — that what hurts the most is not what you did but what you didn’t do — also appears to be true, at least in the long run. Yet it is partly from studies of lost possible selves that psychologists have come to a more complete understanding of how regret molds personality. These studies, in people recently divorced and those caring for a sick child, among others, suggest that it is possible to entertain idealized versions of oneself without being mocked or shamed. And they suggest that doing so may serve an important psychological purpose. Some fixate on the problems and are at increased risk for mood disorders. Some ignore, and thereby avoid thinking about, the problems. Some, in a position between the first two, move carefully among their problem memories and try to deal with the most salient ones. Even the perspective from which people remember slights or mistakes can affect the memories’ emotional impact, new research suggests. A recent Columbia study found that reimagining painful scenes from a third-person point of view, as if seeing oneself in a movie, blunted their emotional sting. But reflection on lost possible selves is not necessarily all bad. In a recent article (see reference below) psychologists Laura King and Joshua Hicks argue that "the capacity to acknowledge what is regrettable in life emerges from maturity and contributes to maturation itself." The key to King and Hicks's approach is a view of goal change as a developmental opportunity in adulthood. While setting goals and trying to achieve them is a process that gives us purpose in life, it is also important to be able to realize when it's more appropriate to disengage from a particular goal than to continue to pursue it. The process of evaluating goals and considering whether it's time to let them go is, as King and Hicks say, one of life's "teachable moments." Acknowledging the necessity to change one's life goals necessarily involves creating new goals that take into account one's current situation. Two additional concepts important in King and Hicks's argument are happiness (a subjective sense of well-being) and complexity (the level of complexity with which one experiences oneself and the world), which they describe as two aspects of maturity. It is the people unable to disengage from currently impossible "possible selves" who are most negatively affected by the bitterness of regret. But while happiness "requires that individuals truly divest themselves of previously sought after goals," the development of complexity "may require an examination of these very goals." A mature person is one who acknowledges the loss of a possible self but is not consumed by that loss and who maintains a commitment to currently important goals. Regrets "become less regrettable as they are incorporated into the ever-changing life story." King, L. A., & Hicks, J. A. (2007). Whatever happened to "what might have been"? Regrets, happiness, and maturity. American Psychologist, 62(7), 625-636. When thinking changes your mind, that's philosophy. When God changes your mind, that's faith. When facts change your mind, that's science. Science is based on evidence. What happens when the data change? How have scientific findings or arguments changed your mind?" You might want to bookmark this site, because there are pages and pages of answers here, way more than anyone could possibly read through in one sitting. And each of the ones I read made me stop and think about its implications. Any serious scientist or scholar will change his or her mind; put differently, we will come to agree with those with whom we used to disagree, and vice versa. We differ in whether we are open or secretive about such "changes of mind": and in whether we choose to attack, ignore, or continue to celebrate those with whose views we are no longer in agreement. There's a lot here about changing one's perspective. And that's a good thing. What have you changed your mind about, and why? Have you ever driven somewhere and, when you got to your destination, had no memory of the trip? It's not that you weren't paying attention. You were. And if something out-of-the-ordinary had happened, you would have been right on top of it. But as long as everything went along in an ordinary, routine manner, you were able to drive on autopilot. In the earlier post We See What We Expect to See, I talked about schemata (which is the plural of schema), the patterns we unconsciously apply to things we perceive in order to organize and make sense out of them. The more often we apply a particular schema, the more deeply ingrained and readily accessible it becomes. Someone who is just learning to drive or is unfamiliar with the area would not have the experience I described above. Only someone who has been driving the same route for a long time will slip into autopilot. Such automatic thinking can be harmless, sometimes even enjoyable, but it can also be dangerous. It can prevent us from learning new things, meeting new people, and finding new ways to solve old problems. A very obvious example of automatic thinking is stereotyping people on the basis of their religion, their ethnicity, or their appearance. But automatic thinking can also happen in more subtle ways that we are often not even aware of. I used to have a friend whom I originally met in a situation where she was the instructor and I was a student. We became friends and interacted in lots of other situations, but she was never able to shake off the instructor-student schema. In her mind, she was always the instructor and I was always the student. This meant that she could never accept that I knew anything that she didn't already know, even in areas in which I had a lot of training and experience and she had none. She was never able either to adjust her schema of me as student or to apply a different schema that was more appropriate for our changed circumstances. This inflexibility of thinking strained our relationship and contributed (although it was only one of several contributing factors) to the dissolution of our friendship. Because of her rigid, automatic thinking, she lost many opportunities to learn new things. She also lost a friend. How can we avoid becoming mired in the ruts of automatic thinking? By seeking a change of perspective. If the situation warrants, try literally looking at something from a different angle. Or try to imagine an event from someone else's point of view. Or, better yet, ask other people for their perspectives on an issue. Look for ways of approaching a problem that are as different as possible from your usual approach. Don't always grab on to the first idea or interpretation that comes to mind. And, at least occasionally, explore a different route on your daily commute. The previous post (see the most recent post before this one or click here) about assimilation and accommodation made me think a bit more about perception. Once you know that both images are there, you will probably be able to switch back and forth between them, seeing first one image, then the other. But you cannot see both images at the same time. Our brain must select which one it will perceive at any given moment. 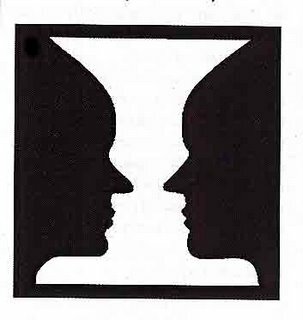 The concepts of differing perspectives and selectivity of perception are not exactly the same, but they are very similar. Both concepts demonstrate that there is more than one way to look at something and that the way we see something is not the only possible way to see it. "I have found it of enormous value when I can permit myself to understand another person. . . . Very rarely do we permit ourselves to understand precisely what the meaning of his statement is to him. I believe this is because understanding is risky. If I let myself really understand another person, I might be changed by that understanding. And we all fear change. So as I say, it is not an easy thing to permit oneself to understand an individual, to enter thoroughly and completely and empathically into his frame of reference. It is also a rare thing." In other words, a change of perspective can lead to understanding, and understanding can lead to personal growth. Yet understanding can be risky: If I come to understand people whose beliefs are different from mine, I might have to change the way I think about those people. And that knowledge might change the way I think about myself. So I have to decide: Am I willing to take that risk? One child in every 150 in the U.S. is now diagnosed to be somewhere on the spectrum of autism. We step back from public controversies over causes and cures and explore the mystery and meaning of autism in one family's life, and in history and society. Our guests say that life with their child with autism has deepened their understanding of human nature — of disability, and of creativity, intelligence, and accomplishment. This week on her radio program Speaking of Faith, Krista Tippett talks with Paul Collins, a literary historian, and Jennifer Elder, an artist, who are the parents of a young son with autism. The Web site contains a wealth of information to supplement the broadcast. You can also download a podcast of the broadcast and an audio version of Krista's uncut, almost two-hour interview with Paul and Jennifer. This is a program that could offer us a new perspective on autism and those who live with it. "As we grow to adulthood (at least in Western culture), we become increasingly adept at seeing the same set of events from multiple perspectives or stances and at entertaining the results as, so to speak, alternative possible worlds." In what has become a classic study Pichert and Anderson investigated whether readers’ perspective can influence their determination of the significance of information and ideas presented in written texts. The researchers wrote two different stories, the House story and the Island story. The House story was about two boys playing hooky from school, with one boy convincing the other to go to his house; the story contained some details about the house that would interest a potential burglar and approximately the same number of details that would be significant to a prospective home buyer. The Island story, about two gulls flying over a remote island, included approximately the same number of details about the island’s exotic flora and its ability to sustain a shipwrecked sailor. These stories formed the basis of two experiments. In the first experiment, all study participants were told to read first one story, then the other. For each story the participants were divided into three nearly equal groups. For the House story, one group was instructed beforehand to read the story from the perspective of a burglar, one group was told to read from the perspective of a potential home buyer, and the third group, the control group, was given no instructions. For the Island story, one group was told to read from the perspective of a florist looking for a place to raise flowers, another group was told to read from the perspective of a shipwrecked sailor trying to survive on the island, and the control group received no pre-reading instructions. After reading each story, study participants for the first experiment were asked to rate the story’s idea units in terms of importance on a scale of 1 (unimportant) to 5 (essential). Non-control-group participants were reminded to keep in mind the role they had been assigned when rating importance. The results demonstrated that perspective did influence the readers’ evaluation of the relative importance of particular details of the story. The second experiment used the finding of the first—that perspective influences what details are considered important—to examine the following questions: “(a) Are the more important idea units in a story better learned or (b) better remembered than less important idea units? (c) Does whether an idea unit will be learned depend upon perspective?” (p. 311). In this experiment participants, none of whom had participated in the first experiment, were randomly assigned to one of three perspective groups (the same groups as defined in the first experiment) for each story. Participants were given two minutes to read a story; they then worked on a vocabulary test for 12 minutes. After the vocabulary exercise they were asked to write as many details from the story as they could remember (the free-recall test). The free-recall test was repeated seven days later. The researchers compared the number of details remembered in the first free-recall test to the number remembered in the follow-up recall test. Results indicated that perspective can influence what details readers decide are important, and that importance in turn affects learning and memory. So our perspective influences not only what details of an experience we notice, but also what details we remember later about the experience. These findings help explain why two people present at, for example, a family holiday celebration may years later tell quite different stories about the event. To understand each other’s interpretations, we must be willing to consider the other person’s perspective.